Reward, and are ready to post fifteen random facts about ourselves as instructed at Sparkie’s blog. 1. We LOVE blogging! Getting to meet new people, sharing our ideas, and visiting other doll blogs! 2. We are very crafty and share most of our crafts here! 3. We each have our own personalities. 5. Lot’s of photostories are coming soon, including the ever lost Part Two of our series we never did finish, the pressures of reality. 6. We don’t accept spam. 7. I really really like spaghetti. Mom loves making it. It’s perfect for dolls. 8. I am very sad to be retiring. Emilie is, too. 9. Emilie is my BFF. 10. Cecile is Jasmine’s BFF. 11. Josefina is the odd one out. 🙁 She is our friend, but she doesn’t really have anyone to bond with. 12. I am soooo excited to receive an award. 14. I am a doll. Did you know that? 15. I’M ON A SUGAR HIGH!!! AHHHHHHHHHHHHHHHH!!!! Thank you Sparkie for awarding us!! 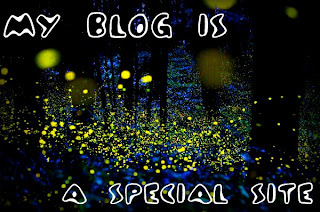 Be sure to pay Sparkie a visit at http://sparkiedolllover.blogspot.com/! Madi, Jackie wanted me to tell you that AGIA is shut down due to hacking problems. Oh no! That’s horrible. I registered. I feel so sorry for Jackie. Jackie, yes the sweet caring Jackie, worked so hard on that message board for us. Then a hacker comes and completely destroys it! That’s so awful. Hopefully it gets fixed soon.